Some are silly, some are useful and some are really fun. You won't be able to resist trying out these brilliant Google tricks yourself! 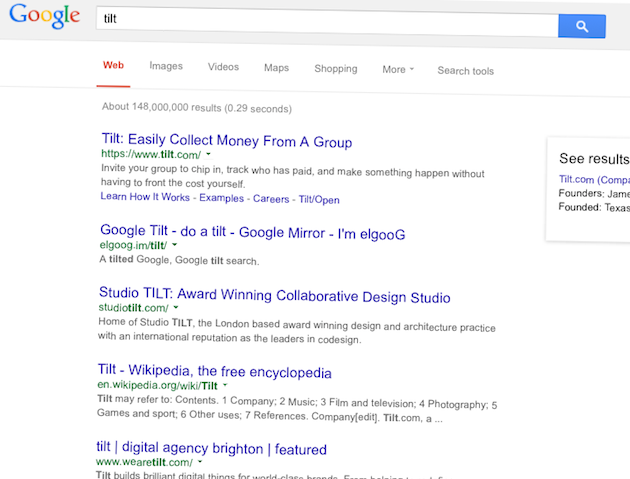 Type ’tilt’ into Google, and your results come up skewiff! 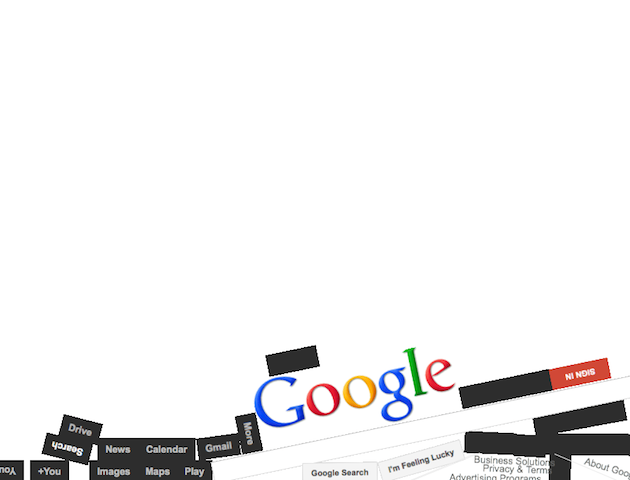 Put ‘Google gravity’ into the search bar, and watch the whole page collapse! 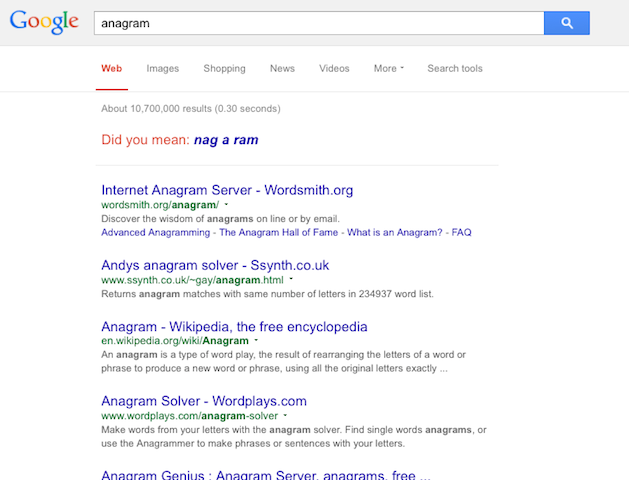 Google is having a little fun with you here – search ‘anagram’ and they suggest ‘nag a ram’. 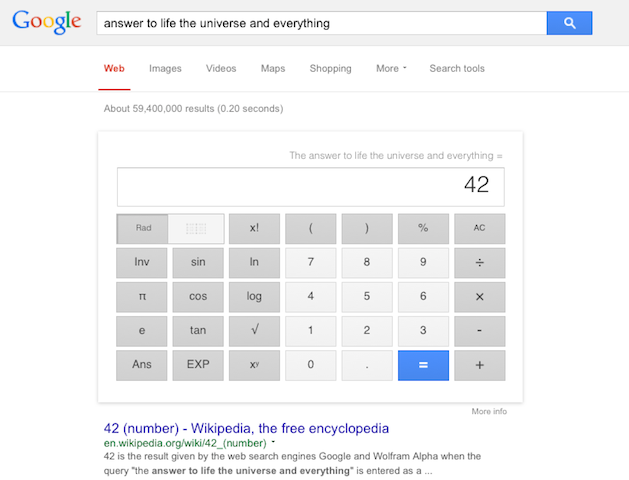 One for Hitchhiker’s Guide to the Galaxy fans, where 42 is found to be the Answer to the Ultimate Question of Life, the Universe, and Everything. But can Google figure out the question? 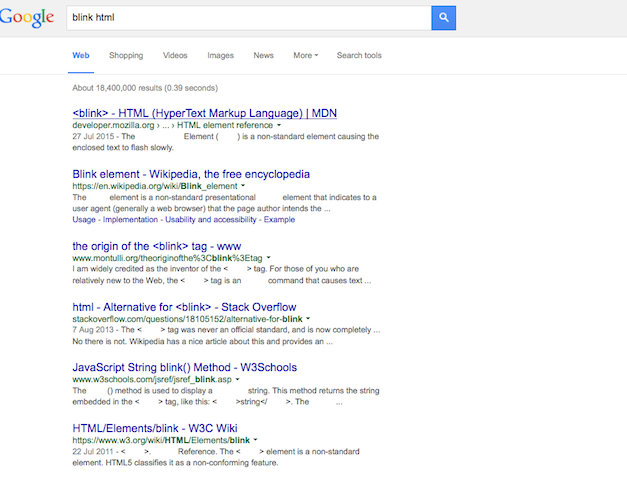 Type in ‘blink html’ and your screen will do this… Why? Well, why not?! 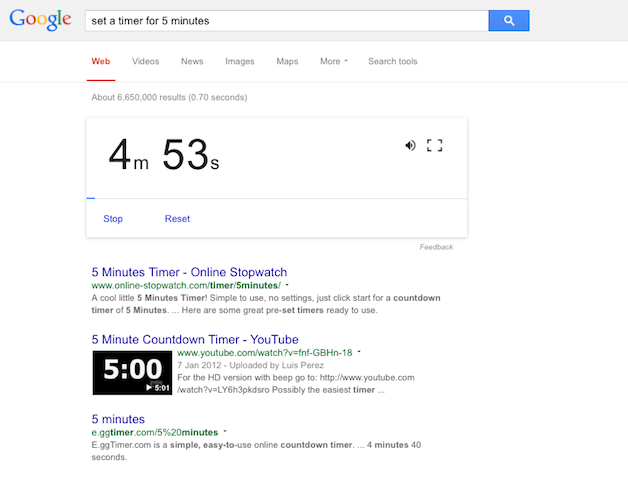 Search ‘set a timer’ and this gizmo pops up. Set it for however long you need and an alarm will sound when it’s finished. Perfect for keeping deadlines… and making boiled eggs! Six Degrees of Kevin Bacon is a game where players link celebrities to actor Kevin Bacon, through the films they have in common. The lower the Bacon number, the closer the connection. But don’t play against Google, as this widget means it has the Bacon numbers of every actor we could think of. 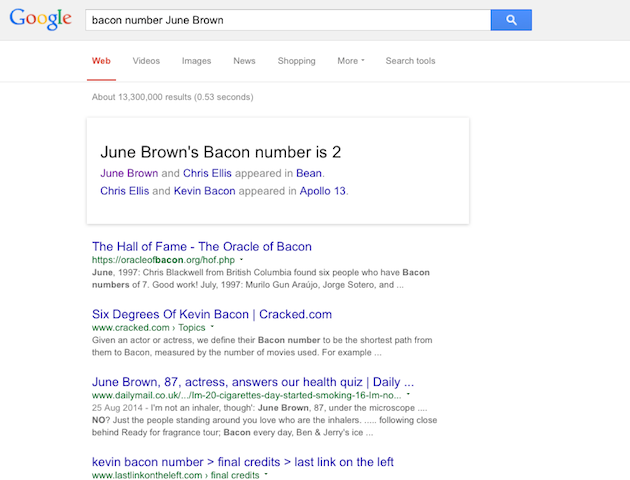 Even EastEnders’ June Brown, who plays Dot Cotton, has a very respectable Bacon number of 2! 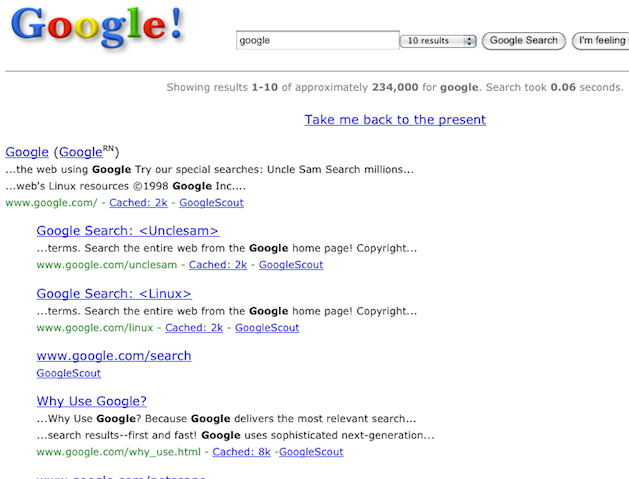 An easy way to time travel… Google searches for ‘Google in 1998’ will transport you to what the site looked like soon after it launched. Doesn’t it look ancient? Another pointless, but fun trick. If you type ‘do a barrel roll’ into Google, it will follow your command. Simple, but satisfying! Ever wanted your name in lights? This is the next best thing. 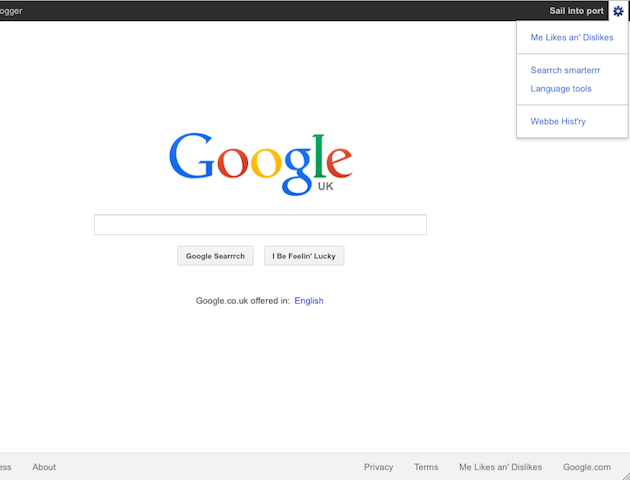 A search for ‘goglogo’ will let you turn your own name, or any word, into a Google-style logo. 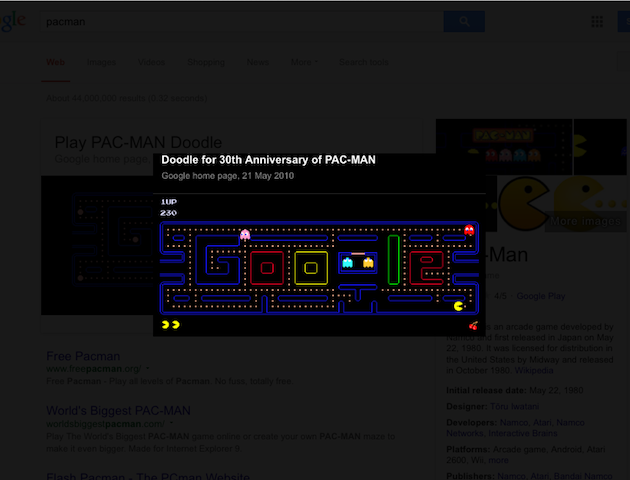 Google created a playable Pacman game around its logo in 2010, to celebrate the arcade classic turning 30 years old. It was so popular, they made it permanent. Give it a go, but warning, hours will just disappear as you try to defeat those pesky ghosts! Zerg rush is a nerdy gaming term for when one player attacks another with an overwhelming number of opponants. Searching it on Google will see lots of letter o’s appear on the screen, destroying your search results, unless you can click them away quick enough! There’s Google searches, and then there are Google searrrches. Google’s Pirate Interface is there because even swash-buckling marauders sometimes need to find out where the nearest emergency dentist is. Give it a go, me hearties!